It only felt like a few months ago that Bing introduced a speed test widget to their search results page to test their internet speed, and now Google has begun testing their internet speed. Allowing their users to test their native internet speed is a step forward in their plan to optimize their search engine to include the best measurement tools for their users. According to Google, faster internet connection leads to faster upload and download speed but low latency periods. 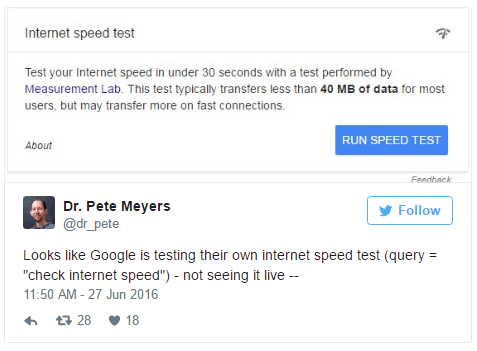 Above is a tweet posted by Pete Meyer from Moz, who spotted a test being run by Google’s Measurement Lab tools. Above, the tweet is a snapshot that Pete took of the measurement tool on top of the search engine tool. It is reported that Google partnered up with Measurement Lab (M-lab) to perform the internet test. Measurement Lab is a company dedicated to providing open source internet data measurement tools. This new feature is an addition to the new tool that calculates websites’ mobile-friendliness, that was added to Google Webmaster earlier this month. The test has not available for every user yet, but Google is expected to announce if and when it will release the speed test tool on its search results. This tool is an exciting new feature that would be very useful tool for SEO, and we hope that this tool makes it pass Google’s trial stage.